The Shire horse, developed in England, traces its history back to the days of the Roman Conquest and is one of the oldest of the draft breeds. The name "Shire" also comes from England, derived from the Saxon word "schyran," which means to shear or divide. The name "Shire," means “county.” King Henry VIII first applied the name "Shire" to the horse early in the 16th century. The Shire horse breed began over 1,000 years ago and includes blood from Belgians, Horses of Flanders and in the 18th Century, Friesians. Like the other standard draft breeds, the Shire was improved by the infusion of outside blood at various times in history. Records exist, dating back nearly 1000 years. During this time outside blood continued to influence the breed since a breed registry did not hamper breeders and no limits were imposed. The Shire horse was the warhorse of England, used by knights in the middle ages. The Shire horse is the purest survivor of an early type that was spoken of as “The Great Horse.” A large, athletic, powerful horse with plenty of stamina was needed to carry the weight of mounted soldiers wearing their heavy battle armor. These horses’ riders could weigh in excess of 400 pounds. Shires come in several different colors. Some may be black, bay, or gray. They usually have a blaze face and some white markings on their lower legs and feet. A characteristic feature of the Shire breed is abundant hair (called feathers) below the knees and hocks. Their foals will weigh 125-150 pounds at birth. Shires have been used for every discipline from warhorse, farming, commercial carriage and wagon driving, commercial logging, dressage, trail riding and breeding. The Shire horse registry of England was established in 1878. The first Shires were imported from England to the United States around the middle of the 18th century. The American Shire-Horse Registry was established in 1888. There are approximately 4,000 registered English Shire horses left in the world today. If they were not domesticated animals, they well could be on the endangered species list. 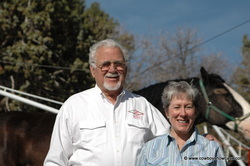 Ree and Renn Zaphiropoulos are the owners of the Diamond Z English Shire-Horse Ranch, located 15 miles west of Cedar City, in Iron County, southwestern Utah. Renn grew up in the Suez Canal area in North Africa, where his Greek father was a sea captain piloting vessels in the International Canal Zone. Renn joined the Greek Navy. After his discharge, he attended a Greek University then immigrated to the United States in 1945. He attended Lehi University majoring in physics. In 1969, Renn started his own business called Hi-Tech Imagery. He later sold this business and became a senior vice –president of Xerox Corporation. During his time in the high-tech world, he met his wife Ree, who was from California, and they married. They built a home in the Bay Area, and planned to spend the rest of their lives in California. While visiting in the Cedar City in 1988, Renn began to think seriously about moving to the area. Renn liked what he saw in the Cedar City countryside: no traffic, clean air, and horses, cows, and sheep grazing contentedly in pasture lands along Cedar Mountain. When he mentioned that he would like to look into moving to this area, his wife thought he had lost his mind. 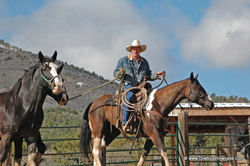 His wife, Ree, said, ”What are we going to do in Cedar City, Utah?” Ree had grown up with horses when she was a young girl in California and had always loved being around them. Renn said, “We could move to Cedar City and you could have your own horse to ride.” Renn knew how to get his wife’s attention. He looked around and asked Ree’s sister if there was any land for sale. In that same year, the Zaphiropoulos made a trip to England and happened to go by the Basque Museum. These people make great beer in England, and use Shire horses. While visiting this museum, they came upon their first live English Shire Horse. When Renn saw this horse up close he said, ” Now that is real horse!” This trip to England and seeing the English Shire horses changed the Zaphiropoulos’ lives forever. The couple returned to the United States. Renn had retired from Xerox, and was still doing some part-time consulting work for companies around the United States. They found some land west of Cedar City for sale, sold their home in the Bay Area of California, and moved to Utah. They began by building a house, barn, and corrals. At first, they had only quarter horses since Ree liked to barrel race. However, Renn kept thinking about the Shire Horses he had seen in England. They contacted Thomas Smrt, a Shire horse breeder who had more English Shire Horses in America than any other person.. He and his horses lived outside of Chicago, Illinois. The Zaphiropoulos’ traveled to Illinois and purchased their first Shire horses from this source. Now that they had their Shire horses, what were they going to do with them? They also decided that they needed to hire a trainer/driver who could handle these magnificent draft horses. They tried several men and then Chris Hone came into their world. Chris Hone is a native of Utah. He moved to the Cedar City area when he was a youngster and started to gallop racehorses on the track for local racehorse owners. He also cowboyed around the country and was always around horses. He later became a jockey and raced horses on the track. As he grew older and his weight began to increase, he became a racehorse trainer and trained horses full-time on the track for a number of years. The fellow who was taking care of The Diamond Z horses at this time was moving to Oregon. He told Chris that the owners of the Diamond Z Shire horses were looking for someone to take over his job. Chris went to work for the Diamond Z. 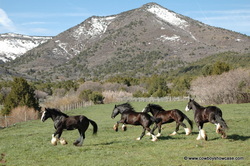 At the time Chris took over, there were four English Shire Horses on the ranch. He looked at photos and read everything he could about draft horses. 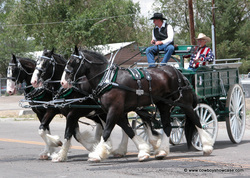 He talked with men who had driven draft horse teams around the Cedar City area. He began to experiment with the four Shire horses at the ranch. 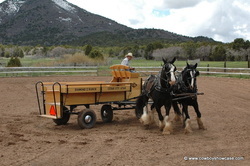 He hooked up the horses on a training cart and began to learn to harness and drive. He spent days in the corral by himself “reading” these horses and began to understand their body language. He found that the sound of his voice was very important in getting these horses to step out, turn, stop and back up.. His driving and harnessing skills were improving each day. He began to take the horses outside on the back roads of the ranch and began to really learn to drive a draft horse team. Chris Hone is one of those special people who was meant to be around horses. He has what is called in the horse world “horse sense” and can read horse’s personalities. Chris Hone is a real horse hand! Renn, Ree, and Chris decided it was time to put their Shire horses out where the public could see and enjoy them. The first parade they remember being in was the Iron County Fair, in Cedar City, Utah. The horses worked great, the parade spectators loved them, and from then on, they were on their way. They expanded their Shire horse herd and upgraded their equipment. They bought bigger horse trailers and bigger trucks to pull them. They ordered a set of custom-made collars and show harness from a harness maker in Wisconsin. They then went back to the Mr. Smrt in Illinois and bought a couple of Shire geldings and a Shire stud. They began to raise Shire colts of their own. They were then invited to drive their team in the Day’s of 47 Parade in Salt Lake City, Utah. This parade is the sixth largest parade in the United States and they only allow twenty horse entries. By this time, they were hooking up six horses. They had the stud, geldings, and mares all hooked together. These horses all got along fine with no problems. Since then, the Diamond Z Shire hitch has appeared in many national parades, rodeos, and many educational endeavors. 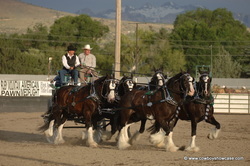 The Shires have appeared in Nevada, Arizona, Wyoming, Utah, Idaho, and Canada. Some of the bigger events they have attended were: Flagstaff PRCA rodeo and parade, Flagstaff, Arizona; Ute Stampede PRCA rodeo, Nephi, Utah; Ketchum, Idaho’s Wagon Days Parade; Calgary Stampede Parade, Calgary, Alberta, Canada; Cheyenne Frontier Days Parade, Cheyenne, Wyoming; Snake River Stampede Rodeo Parade, in Idaho; National Basque Festival Parade, Elko, Nevada; Silver State PRCA Rodeo, Elko, Nevada; Jackson Hole Parade, Jackson Hole, Wyoming; and other rodeos and parades around the west. 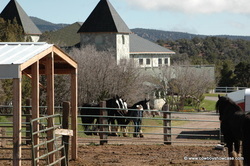 The Diamond Z ranch personnel and horses also participate in many educational programs, including Future Farmers of America, community functions, grammar, and high school and university field trips to the Diamond Z Ranch. Now that the Diamond Z was in the colt raising business, someone needed to start these Shire Draft colts to drive. Chris took to these colts. He had started a number of racehorses and ranch-horse colts in the past so he tried some of his colt training methods on these Shires. He began by moving the horses around the pen, then catching and putting a halter on them. He tried, at first, to use an alleyway then a round pen made out of livestock panels. These horses were so athletic he could not keep them from jumping out of the panel round pen. So he got the owners to purchase a real round pen	where the walls slope out to keep the horse from rubbing the rider’s leg on the inside wall and the walls are high enough to keep the horses inside the round pen. He began to pick up the colts’ feet and climb on their backs. Soon he had the colts gentle enough that he could get a harness on. Then he hooked up the colts with a older Shire horse that was well-broke and began to drive the colts using a driving training cart. He had to put shoes on these horses. 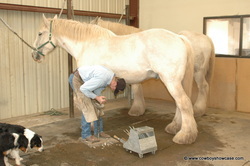 Chris’s brother, Ron Hone, who lives in Rawlins, Wyoming is a horseshoer and, between these two men, they began to experiment how to put horse shoes on these large animals. The	shoes needed to be heated and shaped as the feet on these animals were too large to buy commercial horseshoes that would fit. Chris teaches the horses to stand, untied, when they are being shod and harnessed. All shoes are barium treated on the bottoms to keep the horses from slipping on the pavement and asphalt in parades. After driving these draft colts in the arena, he hooked up and went outside. He would put the colt on the inside next to the shoulder of the road and go down the highway meeting trucks, haying equipment and anything else that used the busy highway outside the ranch. The colts would soon pay no attention to traffic and noise along the highway. All of this driving and pre-conditioning work was very important if you are taking your team and wagon to parades. Ree says, “To do parades safely, you must have, horses and a driver you can trust, first class harness and wagons with good brakes.” It also helps, I may add, if you are fearless in doing all this, as driver Chris Hone appears to be. The Shire hitch horses are between five and fourteen years old. The Diamond Z horses are hitched in a variety of ways. Chris has trained these Shire horses, to be interchangeable in the hitch, which is very unusual. They do not often use the traditional six-horse, same horses in the same place configuration. Chris and Renn have come up with some unusual hitch combinations. They prefer doing unusual hook ups with their horses. They do a three on the wheel, two and three, or three and three. They also do a unicorn hitch with a single horse out in front, two next and then three as the wheel team. (The wheel team is the set of horses that are hooked up nearest to the wagon in a traditional horse hitch). They do use “out-walkers” or “out-riders” at some parades. These people walk or ride alongside the hitch for safety in case of an emergency with the horses, harness, and wagon. 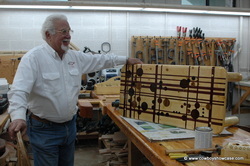 Renn is a master at working with wood and has built and restored many wagons and carriages on the ranch. The hitch wagon that is used in most parades was commissioned and built in Ash Grove, Missouri in 1989. A special set of tugs in the middle allows three horses to be hitched up on the wheel. This special hitch wagon weighs 2500 pounds. At the present time there are 15 English Shire Horses that Chris is working with at the Diamond Z Ranch. The ranch began a crossbreeding program around 1997. They crossed the Shire with a Thoroughbred horse. This cross produced some excellent horses. In May of 2002, the Zaphiropoulos’ donated four Shire/ Thoroughbred-cross horses to the United States Army, 3rd Infantry (Old Guard) Caisson Platoon at Fort Meyer, Virginia. This unit pulls the caissons that are used to put our nation’s heroes to rest. Another Shire/thoroughbred-cross horse was donated to the Washington, D.C. police force to be used for crowd control. All of these horses have worked out well at their new homes. The Future The Zaphiropoulos’ goal with their Shire Horses is to expose the public and their children to these magnificent horses. Renn says, "Don’t try to make a business out of a hobby. It is not something that is efficient and the emphasis is not in finishing it. One cannot charge enough money to pay for the time spent. In life, it is not the end, but the journey you have that counts." The Diamond Z hitch is always well received and the owners and driver love to discuss these wonderful English Shire Horses with anyone that is interested. Lee and I wish to thank the Diamond Z personnel for their gracious hospitality and friendship during our visit to their ranch. Renn Zaphiropoulos passed away August 19, 2013, at the age of 87, in Cedar City, Utah. He was born September 20, 1925, in Port Said, Egypt, to Leonides and Galatia Michalopoulos Zaphiropoulos. He immigrated to the United States in 1945 at age 19. He held a BS Degree in Engineering, and a MS Degree in Engineering Physics. He received three honorary doctorates, had 29 patents, and was the author of Entrepreneurial Wisdom.